I sometimes see parents—even parents experiencing good success at their bilingual aim—who are awfully hard on themselves over missteps or missed opportunities. It’s one thing, I think, to be self-critical to a reasonable degree in order to continuously strengthen our daily efforts; this is a constructive form of critique that can fuel growth. But when this tendency to be self-critical goes too far, it can become counterproductive, sapping energy and undermining action, even causing some to consider abandoning their bilingual dream. Here’s the thing: None of us can possibly be perfect at raising bilingual children. Everyone—and that certainly includes me—inevitably meets with missteps and missed opportunities along the way. And since this aspect of the journey can’t be avoided, it’s best to humbly accept our shortcomings and simply work at learning from them in order to constructively empower our continuing growth and our longer-term progress. In other words, the important thing isn’t perfection, it’s perseverance. As long as you remain persistent in your efforts, and you mindfully try one tactic after another to address the difficulties and frustrations you face, you will eventually produce positive developments and further your success. Yes, you may stumble and fall, and lay there feeling stumped for a while, but if you can just get to your feet once more, time after time, you will always be given the grace to try again. No matter the misstep, no matter the missed opportunity, progress is assured when, in the end, we rise more times than we fall. While none of us can avoid falling from time to time as we trod this road, it’s also true that we will likely fall less, and less hard when we do, by taking thoughtful advantage of the perspective and experience of others who are farther along on the same journey. (Never forget: You Are Not Alone.) This is the enormous value of books, blogs, forums, podcasts, and other forms of information on the subject: Such advice can help prevent at least some of the missteps and missed opportunities you might otherwise face. This isn’t to say that everything you hear about raising bilingual children will necessarily apply to your family—every family must ultimately determine the most effective actions for its own way forward, some of which can only be discovered by actually living through the experience. But this information from others can serve as essential food for thought in making promising and productive choices. Let us, then, put to rest the unhelpful notion that we need to do all this perfectly; we don’t. We simply need to do our honest best, day after day, and playfully persevere past whatever struggles we meet on the path ahead. 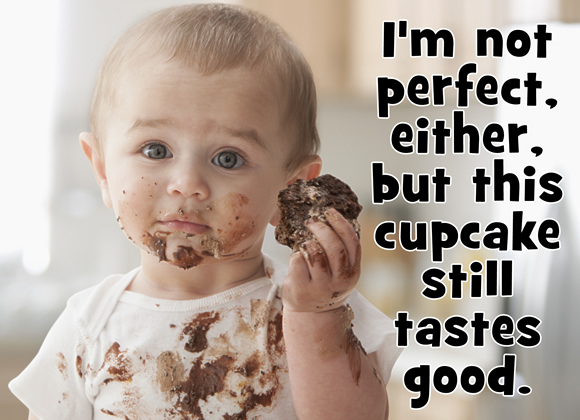 So enjoy your cupcake, friends, messy face and all. How about you? Are you generally self-critical to a healthy degree? Are you ever too hard on yourself?